This topic contains 60 replies, has 63 voices, and was last updated by bougti 3 months, 1 week ago. As I mentioned in an earlier post, there is a Horizon special, “What’s the Right Diet for You” going out this week on BBC2; click on the above link and it takes you to the Horizon home page where you can watch the programme and do an online test to see what sort of dieter you are. Sadly this is only available to people based in the UK, but I think that even if you are not based here you can still see the added content. For those who haven’t seen the programme, in the film a team of scientists from Oxford and Cambridge use a range of tests to divide 75 overweight volunteers into 3 “tribes”. The Feasters: people whose bodies produce low amounts of a gut hormone called GLP-1 in response to food. GLP-1 tells the brain “you have eaten enough”. Feasters go on eating because their gut takes that much longer to say to the brain, “you’re full”. In the Horizon film they are the ones who eat the most at a buffet. The third group are the Emotional Eaters. They were selected on the basis of responses to a psychological questionnaire and are typically the sort of people who turn to food when stressed. Each tribe is then given a different diet to try; Emotional Eaters get a standard low calorie diet with psychological support. Constant cravers are put on 5:2 intermittent fasting and “Feasters” go on a high protein, low GI diet. If you go to the website you can get lots more information and helpful recipes. I was pleased that Professor Susan Jebb, one of the UK’s foremost diet experts, had chosen 5:2 intermittent fasting as a solution for the Constant Cravers. They are probably the toughest group to help since their genetics make them particularly susceptible to over-eating. I think it is a novel way of approaching dieting and the dieters do impressively well on their allocated programmes. The reality, of course, is that most of us are a mixture of the three tribes (I am mainly Constant Craver, with some Feaster and Emotional Eater thrown in). I also think that most of us would benefit from all 3 solutions. A diet high in protein and in low glycaemic carbohydrates, the advice given to the “Feasters” will keep you fuller for longer, whatever your tribe. And I, naturally enough, think most people would benefit from doing the Fast Diet, whether they are Constant Cravers or not. As for the Emotional Eaters, well most of us would relate to that. Losing weight is tough and we need all the psychological support we can get, whether it is family, colleagues, or people they meet on a site like this one. One of the purposes of this website is to bring people together to help each other and I have been delighted by the atmosphere and the helpful comments made by many people. Thanks for the overview Michael. It IS frustrating not being able to access these programs in Australia for as long as 6 months after the UK. But your summation is spot on. We are all bits of all 3 categories and 5:2 seems to work for most. I am definitely part of all three types. I found it easy to lose weight with 5:2 and I really appreciate having the support of people on this site to help maintain. I still need to fast twice a week and keep off the sugars and processed carbs. 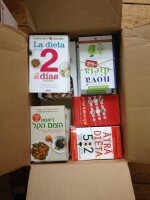 Thank you again, I am saving money and time on food, diet books and supplements. This forum has also been so supportive and helpful. Hi All, I am in the UK and saw the programmes. While they were certainly worth watching (if you can) Michael’s summation above is all you really need to know about it. It certainly told us nothing about 5:2 that we didn’t already know as 5:2 vets. In fact the ‘Constant Cravers’ were on a different version of 5:2, where they had to do their 2 days consecutively and were allowed up to 800KCal (no mention of why, or why the number was the same for male and female). I checked my results on the test and I came up as overwhelmingly and almost equally split between Constant craver and feaster with a little emotional eater thrown in there. That seems about right for me and I definitely think that the programme gave me ideas of how to deal with my non-fastdays (high protein, low GI to deal with the Feaster in me). I came out as 50% CC, 47%F and3% EE. I enjoyed the Horizon series, but I found myself getting quite emotional listening to the stories of some of the volunteers and understanding exactly how they felt about themselves and how much they wanted to change their lives by losing weight and becoming healthier. I really hope the the series spurs other on to do something about their own situation. When I started 5:2 I aimed for a 4st loss and was concerned that I wouldn’t be able to do it as I’ve never reached goal on any of the other numerous and varied diets I’ve tried in the past. I’ve only got a couple of lbs to go to reach my original goal, and I’ve readjusted it and am now aiming to lose another 2st. I’ve done it in two parts with an unplanned 9 month break that involved regaining some of the weight, but this time I’m staying on it until I reach my goal and then I’ll be on maintenance forever. I’ve finally managed to rid myself (almost) of my bad eating habits and am now listening to my body and eating when hungry, and most importantly recognising when I’m full and stopping. When I restarted 5:2 in August I found this website and have been contributing since then. It is great to talk to people in the same situation as me who are all willing to give support, advice and tips and has made life much easier. I KNOW that this time I am going to reach my goal, and that I’m going to stay there. My friend was actually one of the ‘Feasters’ on the programme and he lost the most weight throughout the course of the programme. He has kept it up and looks great! Found the programme so interesting and picked up a lot of tips for myself! Looking forward to seeing it sometime in the future from the state of Indiana, USA. Thank you for sharing this info and this site as well. Will make a menu for 4:3 that is geared for feasters diet on feed days, but only 3 meals with the calories counted to match TDEE with exercise. Living in Oz I have not seen this program either but am not surprised that different styles of eaters require different styles of dieting. I myself have been successful on about three other diets but ultimately found them unsustainable in the long run, this one though, after giving myself time off over Xmas/New Year I was pleasantly surprised at how easy it was to pick up again! I have also gone back to the CSIRO diet on my non fasting days as it is higher protein/lower carb diet, very easy to follow and a great whole family strategy. I did the test twice as I was convinced and believed for years that i was an emotional eater, but it seems that I am a constant craver.I do think about food all the time and I didn’t realize it! The model of 1lb fat was very memorable and I am going to re-think FD to make sure that no carbs are consumed, so that the fat burning doesn’t stop. I have watched all 3 programs and found it quite helpful and interesting. It seems I’m mostly a CC but with a splash of Feaster thrown in. I think of food quite alot IF I’m inside the house and it’s readily available for me to grab, bit of a ‘grazer’, otherwise if I’m busy doing something or away from the house I don’t think about food or get hungry for some hours. As for my other habits; I always eat my meals on smaller salad plates but sometimes after eating a meal I’ll eat snacks & never really getting too full….. BUT my worst thing is I EAT TOO FAST! I’ve always said that “mothers are the last to sit down at the dinner table and the first to get up to clean up”, LOL! I learned some good hints from that show; 1) SLOW DOWN in my eating, 2) surround myself with better snack choices and 3) continue with a Fast Diet program. I watched all 3 and was very surprised I was the constant craver 60% with forecaster 21% as had thought I was emotional eater. I tend to go long times with no food in day as very busy job then come home and snack on carbs . I have found in past high protein diets do keep me full and have tried 5:2 and have no probs missing breakfast and lunch. I have decided to restart 5:2 on the back of this . I watched the programme. It was interesting – but didn’t actually tell me much that I don’t already know! I did find the ‘which diet’ approach was a tad simplistic….like most people I don’t fir into just one group…I am mainly a constant craver but with definite streaks of emotional eater embedded…which the online-questionnaire proved. One thing that confused me a bit…maybe I misheard…but were the 5:2 group told to take 800 calories in a fast day? I though it should be 500/600? I watched it and was also surprised when I took the test- I am 60% CC. Didn’t think that-but pleased to say having been doing the 5:2 for 10 days now(first time ever) I am losing weight and not finding it too hard… so far so good. I tend to agree with Buttonboots in that I found it slightly simplistic. I too would like to know their rationale behind 800 cals on FD; and why the Constant Cravers were told to fast 2 days on the trot. I was dubious about the use of commercial slimming clubs for the Emotional Eaters. When I attended one, I didn’t find it particularly supportive and it did little to establish sustainable changes in my way of eating – unlike 5:2, for me. (In fact I found Overeaters Anonymous was a better space for exploring emotional issues, although I did leave there eventually, too, as I didn’t really agree with the 12 step ethos. Yup, I’ve been around the block a few times!) My suspicion is that the support the Emotional Eaters got from each other, in their online forum and the Cognitive Behavioural Therapy were more important than joining a slimming club. There were only 2 people who did not lose weight out of their large cohort. Good ‘success’ rate but I was immediately intrigued about those 2 people. I hope someone from the scientists follows up and offers them some further support. The right diet for me is a ketogenic diet but then I’m diabetic so can’t metabolise carbs. I do however think keto-adaption works well with IF. Agree with comments above. People are not one or the other tribe. However some very good hints and tips, especially eating slowly, avoiding high GI foods and being more aware of the way you eat. I liked the idea that you should see food in shops as being just marketing, and refuse to fall for it. Bootsy Badger, I agree. What about the people who were not successful, even with the added motivation of being part of the programme? I would have liked them to have said more about what the CBT was, and to have been explicit about the fact that it can be uncomfortable not to eat when you want to. Every overeater has to accept that and not look for some system that promises they never have to face that and deal with it. Also I would LOVE to have a follow up in a year. That would be interesting. I watched the Horizon programme and it was spot on. Two years ago I lost 2.5 stones on the Cambridge Diet and was delighted with the results. I am now heavier than I was when I started the Cambridge. I have lost motivation to exercise and diet. However I have to get myself on track and do something. My plan is: have Cambridge products on the 2 fasting days a week. Delete sugar and alcohol from my diet, and focus on having a healthy, balanced diet of max 1500 cals for the 5 days. Do Jillian Michael’s 30 Day Shred to get back into exercise. Baby – the body cannot live without protein, so it stores it in the muscles. That is why when you go on a diet, you lose muscle weight, too. Thanks for that really helpful link. Very interesting. I realise that muscle weighs more than fat and that progress would be slow: however what about % body fat and dress sizes? Would they not reduce at a faster rate than the scales might indicate? One pound of fat weighs the same as one pound of muscle. The reason you might gain or not lose if you start exercise is you are tearing down your muscles and the body needs to retain water to fix them. It is the additional water weight that is the problem. Your % of body fat may decrease with exercise and you may be able to fit in smaller dress sizes. It depends on whether you want that as a goal, or weight loss. If you want both and continue exercising, be prepared for slower weight loss than you might have hoped for. I think the major impact is that the program dismisses the simple “Calorie in” argument for weight gain. There are lots of causes, some genetic some life style and I over eat because I am fat not the other way around. So rather than beat myself up for “lack of self will” I can lay that one to rest and focus on the changes needed, fasting works ( third year 3 stone lighter and kept off) plus drastically reducing processed carbs, eating within an 8 hour window, not being sedentary, support from this web site and trying to keep to a Mediterranean diet. Phew its not easy but at least I don’t feel its all my fault. You’ve cracked this healthy way of life. Fasting, reduced processed carbs, 8 hour eating window and keep moving, together with website support, and the Mediterranean diet. In a nutshell! Keep on keeping on! I agree- it’s the first time ever that I don’t feel guilty every time I eat something, and the flexibility is great. I sent off for the zero noodles and have researched them too. Not only are they not harmful- but they can help medically- and they are a good substitute for pasta, rice, noodles etc. Upwards and onwards! I watched the programmes and did the test and came out asa 70% constant craver and 30% feaster – which I think is about right. I knew that I was not an emotional eater, as I tend to go off food when I get stressed (more likely to take it out in exercise such as a long walk). After a couple of false starts (one lasting about six weeks and one less than a week) I have now been doing 5:2 for about six months and lost 4½ stone. I found the first couple of weeks the hardest, but now I find it quite easy, and I can fit it into my lifestyle – changing my ‘fast’ days if I have a social commitment where I know that food and/or drink will be involved. Well, this is interesting, and I’ve done the test. Result 44% Constant Craver, 31% Feaster, 25% Emotional Eater. In other words a bit of everything. For me, this has brought up 2 questions that seem anomolous. 1. I have ADHD. I have food intolerances that have an addictive componant to them. This is not uncommon in people with ADHD. It works like this: eat some non – tolerated food, enjoy it a lot and it may even be a favourite food, feel somewhat compelled to eat it or crave it constantly, a while after eating it, say 1-2 hrs but could be longer, there is an adverse reaction of varying sorts, start craving the food, eat the food, adverse symptoms stop, a while later adverse reaction begins again,And the cycle keeps repeating. I had a full elimination testing regime with a dietitian and then spent a no. I have this type of intolerance to most grains, and am intolerant to amines and various added chemicals, the cabbage family, raw but not cooked onions ,peppers/chillies etc etc. For about 8 years in the past, I only ate things I didn’t react to with the addictive quality, and during that time I did not crave food at all and my profile on the test would have been different. I just didn’t seem to get hungry much and could walk past food no trouble.. Think I better go and do the test from my memory of that time, and see how that works out. 2. My OH has been in the past, on the Pritikin 3% fat diet for 12 yrs. The anomaly I’m seeing is that on that regime the results ( and havin g a lot of contact with people on it because it was me who had to find the foods, plan and cook it etc) is that this Low Protein, Low Fat, High Carbohydrate way of eating acts differently to the Low Fat High Carb diets being repoted on. In the 3% FatPritikin Diet not only are people not putting on weight, but they lose it and a few people get underweight. Also there are diabetic people, type 2, who are no longer diebetic, most people’s cholesterol drops a lot to healthy levels, cardiac patients living way longer than expected. OK, went back and did the test again from how I felt, operated with food during the 8 yrs fully on my diet as worked out by the dietician for all my intolerances etc. Just to reiterate, during that 8 yrs I was not eating any of the foods that had the addictive aspect of the intolerance. Result : I am not any of the 3 different types of eater given in the programme. There was advice that my overweight situation then would be because of possibily large portion sizes, no exercise etc. I think what this is confirming for me is what I already knew- that I have to get back onto my eating regime as worked out years ago by a dietician after extensive elimination testing, as well as stay on the 5:2 diet. As for excercise, Id love to but have been disabled by a chronic medical condition and normal exercise is out. Anyway, thank you Michael, so much, for all the information you give in your documentaries. At last, with 5:2 I have a way , that is working for me, to get off the weight I’ve put on through disability and my own foolishness for going off my personal diet regime that had been working so well for me. Use Google Chrome with the “Hola” plugin. It allows you to watch UK programmes as if you are in the UK. I’m not in the UK and I watched the series that way on the BBC web site. I have now been on the 5:2 diet, (don’t like diet, more like a strategy I feel)since 1st Oct 2014, and am extremely pleased with the results! Having lost 16 kg and especially my Girth I am very pleased with the results. I had lost weight before, doing a lot of extraneous exercise, like cycling every day summer and winter for about between 50 and 100 km /day. Being now 73 I am not really wanting to do that amount of exercise ‘just’ to keep to a ‘sensible’ weight. So that’s when I came across Michael’s book and programme about the 5:2. I don’t class myself as an emotional eater, although one does get despondent after trying everything to lose weight, but feel indeed that genetically that I am so ‘made’. After all when one eats the same as someone else and the one puts on weight and the other not, how do you make that out? I had walked the Camino de Santiago in 2010 – 800 km in 33 days and didn’t lose an ounce!!! My metabolic rate has to be stimulated i.e. HR above 150 into the aerobic zone before I can ‘burn’ calories. I can also add that my glucose levels were also up to about 7.2 and an average blood pressure of about 133/85 with a pulse of 75 and those have both come down; glucose being now 5 to 5.5 average and blood pressure coming down to 118 to 122 / 73 to 76 and a pulse of 58! But I must say, thank you so much Michael for doing this research and for publishing the results, it has changed my life! Hi there love the website very informative. I tried the 5:2 diet when you first televised it and it did work but sadly i lost my way a bit with sticking to it and have since given up. I started again last week but have read that there is an alternative fast where you stop eating at say 8pm then fast for 16hours (14 if a woman) and then eat within the next 8 hours then repeat next day. It sounds easier than the 5:2 personally but do you think it will give the same results ? presume you can eat whatever you like otherwise. I have just done the Horizon special Test and i am very overweight and a complusive eater mainly so would be keen to hear your opinion Michael as to which diet will do the job. Just letting everybody know that you can watch these specials on Youtube. I am in Australia and have watched them on my computer. I watched the Horizon special in Australia on utube..I knew the intermittent diet works for me and definitely which group I belong to. I followed the Horizon 800 calorie fast as my partner struggles with hunger with fewer calories. We have both lost 10 pound since the beginning of January. So this is working well but as previous comments, what was the rationale for 800? Are there less benefits on the higher calorie plan? I too am sticking to the 800 calories suggested in the Horizon series and have lost 21 lbs since January fasting on 2 consecutive days per week which I find works well for me as my body seems to get used used to fasting and the second day is easier than the first. I am very happy with results and am now lighter than I have ever been as an adult ( I am 60). I plan on keeping up IF for the rest of my life as I am definitely a Craver/ feaster so eat low GI Mediterranean on non fast days. Again a good insight to a programme from Michael, I do like to re watch the original Horizon, Eat, Fast and Live Longer. It gives me the jolt I need to see Michael being told a third of his body is fat!! Mine I am afraid to say is half of my body is fat that is why I have so much back pain me thinks!!!! My wife Sarah is following Mediterranean diet. She says she feels a lot better already, and she has been following it for only 30 days. She loves the Mediterranean diet food and she actually enjoys being on this diet. She decided to start following it after reading ebook “Mediterranean diet weight loss results” on Amazon. On Mondays she eats Greek yogurt with strawberries and oats for breakfast. For lunch, she usually has whole grain sandwich with vegetables. And when it comes to dinner, she often makes tuna salad; dressed in olive oil (she loves it). It’s really delicious. For a dessert she is allowed to take a piece of fruit. Hope you’ll enjoy in your diet, and achieve weight loss & health benefits. Why weren’t each of the tribes split into 3 subgroups corresponding to each of the different diets? So, nine subgroups in total. Surely that would be a more scientific approach, enabling a far better comparison to be made. Yeap I’m a feaster and that hasn’t changed LOL! Low GI is a good plan, I have cut out sugars and refined carbohydrates, and it makes a good combination with 5:2. I bet it will feel great after Christmas food, presuming that is what took your eye off the ball the last couple of weeks. Jenn, good luck! If you are like me, you will quickly find that 5:2 suits you well. I hope so, it is just great that it can be so sustainable. The forums can be really useful with helping you stick to it if things get tricky, so join in! Wow Cinque, how do you combine more than one plan? I like low GI eating much of the time, but it’s only the thought of a ‘treat’ tomorrow that’ll get me through a fast day today! Start with one thing at a time I guess! I did it one at a time Jenn. I cut out sugar ( including most fruit) five years ago to see if it had anything to do with the poisoned, hungover feeling I was struggling with. Within a few days I could see that it did. It also stopped the intolerable cravings to eat that I had, and as a result I lost about 20 kg over the next year or so. But then I plateaued and put a bit of weight back on, so I hovered about 10 kg above my healthy weight. I began 5:2 last July and that 10 kg is going now. I was inspired by What’s the right diet for you and other programmes by Michael Mosley. Difference for women on 5:2 is 500cal in book and 800cal on programme. Which is preferred and why? I’ve been on the Atkins diet for 5 weeks. I’ve only lost 3 pounds, and I’m sure that was only water. I feel awful.I stay so tired and sleepy. My heart beats so fast when I exercise, I feel like I will faint. So…I don’t get as much exercise as I once did. So..In looking for another approach. I’ve never been a big eater,in fact I used to only eat once a day. My biggest problem is I am a sugar addict. I’ve actually felt like I would get sick if I didn’t get sugar in my blood quick.I got though getting rid of the sugar intake, I manage to get down an egg,and a slice of bacon in the mornings.when llunchtime arrives I think I cannot eat all this stuff, I’m just not hungry. I eat again mostly meat and eggs. Everyday morning noon and evenings,it’s meat and eggs. I feel terrible and see no results. I’m not an emotional eater, I do crave sugar,but do not give in to it. I don’t have a problem with hunger. I do have a problem with not being able to lose. I’ve had a total redirecting,and take medication for it. I had thyroid cancer, but have no signs of any others malignancy. So.. what is the right diet for me? Is there any out there that can help me lose ? I’ve been on the Atkins diet for 5 weeks. I’ve only lost 3 pounds, and I’m sure that was only water. I feel awful.I stay so tired and sleepy. My heart beats so fast when I exercise, I feel like I will faint. So…I don’t get as much exercise as I once did. So..In looking for another approach. I’ve never been a big eater,in fact I used to only eat once a day. My biggest problem is I am a sugar addict. I’ve actually felt like I would get sick if I didn’t get sugar in my blood quick.I got though getting rid of the sugar intake, I manage to get down an egg,and a slice of bacon in the mornings.when llunchtime arrives I think I cannot eat all this stuff, I’m just not hungry. I eat again mostly meat and eggs. Everyday morning noon and evenings,it’s meat and eggs. I feel terrible and see no results. I’m not an emotional eater, I do crave sugar,but do not give in to it. I don’t have a problem with hunger. I do have a problem with not being able to lose. I’ve had a total thyroidectomy and take medication for it. I had thyroid cancer, but have no signs of any others malignancy. So.. what is the right diet for me? Is there any out there that can help me lose ?